MSI has unveiled it latest laptop, with the MSI FX600 aimed at 'those who demand style, functionality and power from a notebook'. The MSI FX600 uses Intel Core i3 and i5 processors, and boasts THX surround sound and the company's Cinema Pro technology. "Enjoy watching movies in all their glory with MSI's Cinema Pro technology for optimal sound and video setup," explains MSI's release. "With just a touch of the Cinema Pro hotkey, the machine instantly kicks into film mode delivering richer colours to maximize your cinematic experience," it continues. "MSI have partnered with world leaders in sound design technology to bring professional theatre-grade THX smart TruStudio PC sound to the F series. "With four top-end internal speakers for undistorted sound, regardless of music type or frequency band." 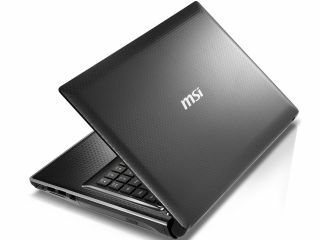 Specs-wise, the MSI FX600 starts with a Intel Core i3-330M 2.13GHz processor, offers 4GB of DDR3 RAM, a 15.6-inch 1366x768 screen and 500GB of storage. You can upgrade to a Blu-ray drive and Core i5 should you desire a little more entertainment power. The FX600 will be available to buy from Argos with a UK release date of August and will cost from £599.99.